The best way to get to know a community is by scheduling a tour. See the facilities, meet the staff and residents, and get a feel first hand what it's like to live at BrightStar Care - TX - Jersey Village / NW Metro Houston Home Care. BrightStar is a national company that is locally run so you can see us in your grocery store and at the little league games. You or your loved one will get the care that is required when and where it is needed. We don't answer to a government agency, we answer to you. 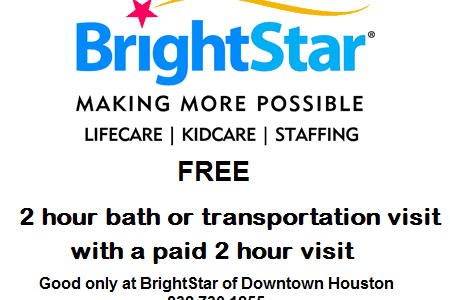 Act now and get a free 2 hour bath or transportation visit with a paid visit of 2 hours or more. BrightStar offers 24/7 client and caregiver support, our phones are always answered by a trained BrightStar staff member, not an answering service. We have an RN on staff and on-call; the Director of Nursing provides direct oversight of every patients care and then validates and documents our performance with supervisory visits and updates to the Plan of Care. The plan of care is always kept in the clients home so all caregivers have access to it. All levels of care can be provided by BrightStar, from companion to skilled medical. Many times our clients require different levels of care at different times in their lives, there is no reason to find multiple companies for each level of service; we can provide it all. All our caregivers are trained and experienced employees of BrightStar; we conduct extensive background checks and drug screening on each employee before we hire them. All caregivers are CPR certified. Guaranteed Compatibility: We match individual caregivers with each client - satisfaction guaranteed. We are the only agency that has developed CareTogether and we provide it to you at no cost, with no advertising. It will keep family and friends discretely informed of the information you want them to have based on easy to control security settings.